Like Huangdidian, Battleship Rock is fairly well known and I debated writing anything about it on here. However I found a really enjoyable and empty ridge route here. I also hate backtracking: Too many routes are "start in parking lot, walk up stone steps, see view, walk back down steps", which is really dull. So I've put together a few routes here, all intersecting with Battleship Rock. Two from the Shilin side and two from the Beitou side. A full route across the hills here wouldn't take more than 2-3 hours and they are backtracking free. This path starts right by Qilian MRT Station. It tracks around the back of Yangming University and can feel surprisingly wild in places. However a quiet road pops into view every now and then as a reminder you're really not remote at all. There's a great rock seat above the valley about three quarters of the way up. As you reach the top the disconcerting sight of the college running track comes into view. They've literally leveled the top of the mountain to make it. Fortunately they left a narrow granite ridge behind it and the path continues up here. There are ropes and good footholds. The summit looks out on the Guandu Plains and a nearby gated housing development. Oddly a fair few of the mansions in this are abandoned. They must be worth tens of millions in NT so I'm very curious as to why they're decaying. Continuing on you'll drop into a wide trail through a narrow cleft in the ridge. Turn right and after a minute or so a steep trail up to Battleship Rock will appear. Looking back on the ridge walk from the path up to Battleship Rock. Directions: From Qilian MRT station walk across the road and into the small park on the hillside. You should be able to pick up a trail in here. You may come to an abandoned futurist-style pavilion and think you're at a dead end. However just hop over the wall to the left and you'll see the trail. The boring stone steps trail that 95% of people use starts by a tunnel next to Yangming University. A short way up it a dirt track branches off to the right. There is a little maze of exposed trails that climb up a bare rock face. Clearly there was a fire fairly recently leaving few trees. At the strange rock with an old man's face on it there is a trail straight up to Battleship Rock. Another couple of dirt and paved trails begin around an electricity substation just behind Veteran's Hospital and are quite similar. The rock itself does actually look like a battleship, when viewed from the trail just beyond it. It narrows into a sharp point like the prow of a ship. This point is very scenic and so is often crowded in good weather. The trail continues down and behind the rock. Ignore the side trails and continue heading upwards. Eventually you'll come to a fork with this sign. This route takes the right hand fork. 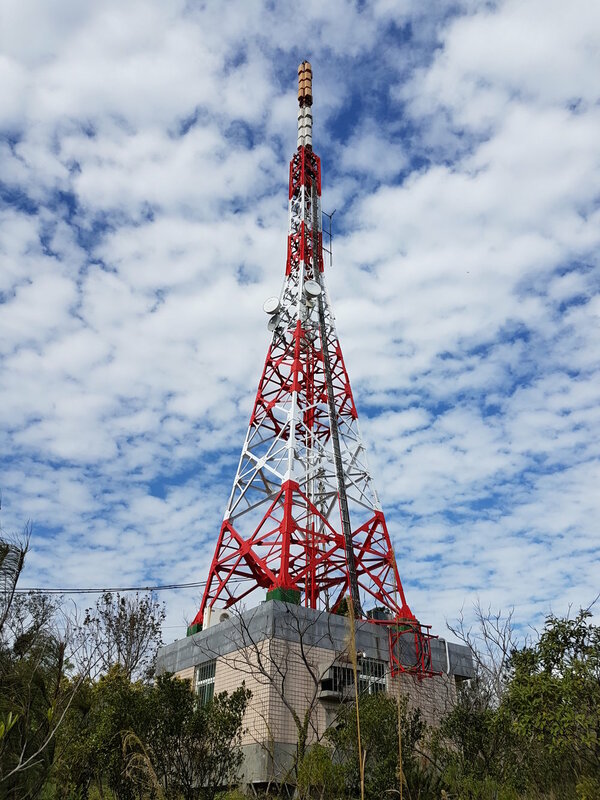 After summiting a small and unspectacular peak you'll find yourself in the large Yangmingshan 1st Cemetery. Some people aren't keen on walking through cemeteries; finding them too morbid, or perhaps they are superstitious. I don't really mind it and I find the variety of tomb styles interesting. This cemetery also has beautiful views of the main Datun volcano group. The way through is not always clear. 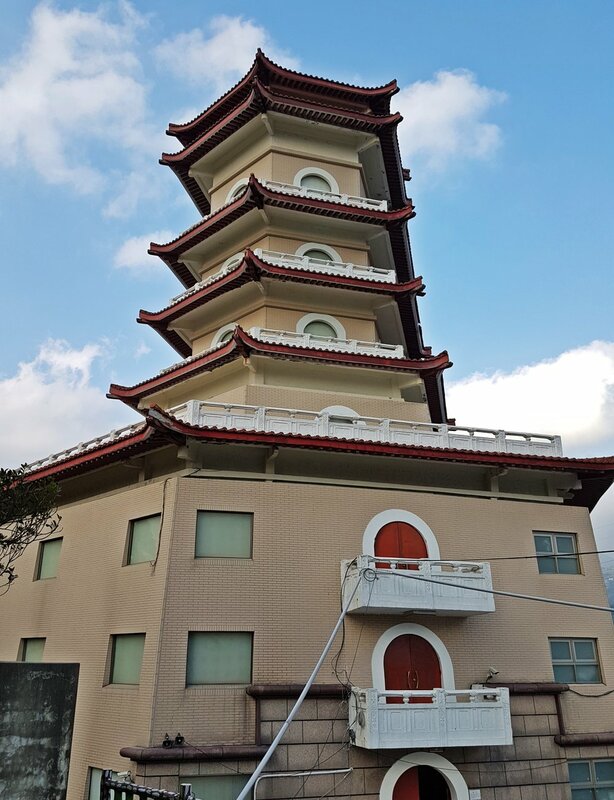 You'll need to head towards the pagoda-like columbarium tower. These buildings can often be seen in Taiwan's cemeteries and are used to store ash in urns. I was curious and went inside. The place is very clean and clinical and it looks a lot like a gym locker room. It was a little too eerie to stay long. From here there is a short walk downhill on a road towards the sulfur valley. On the way you'll pass a large memorial for a doctor and chairman of a Chinese culture group. It had a lot of strays inside so we didn't look around. Just past the Yangmingshan Park HQ building is the entrance to sulfur valley. There are small fumeroles, sulfur rocks and an acidic green lake in here. A well-developed trail loops around the lake and ends at a small public hot spring for your feet and legs. The water in here is a warm 40 degrees and felt really good after the walk. Nearby a bus stop is frequented by buses heading down to Xinbeitou MRT. Taking the left fork you'll stay on the main trail towards Zhaoming Temple. There is an absolute maze of dirt tracks branching on and off this trail but most seem to just loop around the main trail or go down to the Wellington Heights housing estate. You'll emerge on a small road opposite the temple. Zhaoming is an unusual temple. It looks like it just dropped out of Thailand with its steep-pitched roofs. It's a Buddhist temple and is adorned with prayer flags. The deity in the main shrine is the thousand-handed Guanyin. This god deals with matters of marriage and so Zhaoming is often called the 'lover's temple'. The main trail continues just past Zhaoming. A rock of Buddhas being watched by other Buddhas. A little way down here there is a detour on the right towards a large red and white radio tower. Clearly this trail is popular with downhill mountain bikers and some have built a few jumps here. Head up past the tower and its unusual chair. 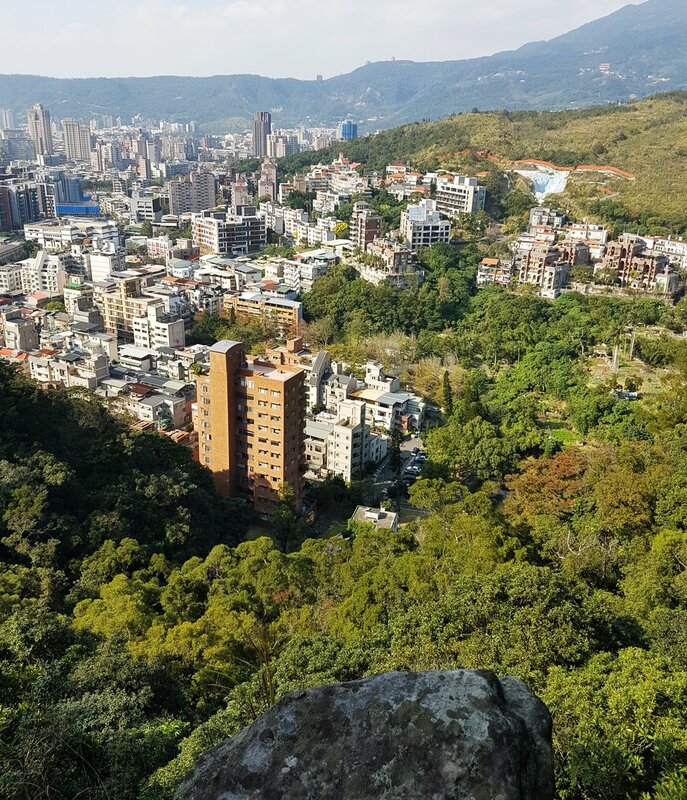 The trail comes to a sheer cliff with great views over Xinbeitou. It looks a little like a French or Swiss ski town from up here, if you were to cut some of the crummier buildings out. A trail heads down towards Xinbeitou from around here but it's not particularly interesting. Heading back to the main trail you'll soon arrive at Mt Danfeng (Red Phoenix) A bench has been sculpted into the shape of phoenix feathers here, though to be honest the view is better from the cliff by the radio tower. After Danfeng the path drops steeply and ends in the cemetery for an old KMT general. This tomb is ruined and forlorn, and it looks like part has been deliberately knocked down. I'd not be surprised if this was the case given the guy almost certainly had a big part to play in the White Terror Era. The trail will emerge by some houses. The buildings of Zhonghechan Temple to the left are worth a quick look and are architecturally a little unusual. Apparently it is one of the three temples in Taiwan where Japanese people's ashes are buried. From here you are about equal distance between Beitou and Qiyan MRT Stations. You can check the routes and locations on the Hidden Taiwan Map. After a little more time on Google Earth I apparently missed a small Japanese rock shrine near Mt Danfeng, and a few pagodas in the forest behind Zhonghechan.